If you’ve experienced tooth loss, you know replacing your teeth is your top priority. Once a tooth or multiple teeth are missing, you begin to appreciate every tooth that you may have taken for granted. Dr. Joe Isaacson offers an amazingly versatile procedure for patient’s that want to replace their missing teeth and have a properly restored smile: dental implants in OKC. 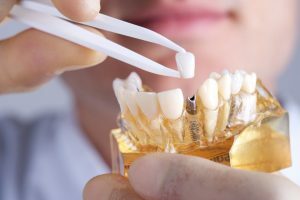 Dental implants can be combined with single dental crowns, bridges, a partial denture, or even complete dentures to fill the gaps in your smile in the most natural way possible. Would you like to learn more about the many benefits that new, functional teeth replacements from Dr. Isaacson can offer you? Replacing missing teeth is essential for patients to maintain both good oral health and general health. Traditional teeth replacements restored only the visible parts of missing teeth (above the gum line). Now, dental implant supported tooth replacement solutions substitute both the roots (below the gumline) and crowns of lost teeth for the best, natural solution. If you think that your age, the reason for tooth loss, or any other excuse is a good reason to keep putting off your dental implant procedure, we strongly encourage you to reconsider! There’s no law that governs who deserves to smile. We believe you deserve to have a healthy lifestyle and feel confident while doing it. If you’re willing and able to take care of your oral health care starting now, aren’t you worthy of a healthy smile? We think so! Losing teeth is like a domino effect. Once you lose one, the rest of your smile becomes susceptible to further tooth loss. Dental implants re-stabilize your jawbone by placing a biocompatible, titanium implant post within the jawbone to keep your jawbone sturdy and strong. When you lose teeth, you are forced to eat soft foods that are easier to chew, rather than enjoying foods that healthier for you (and probably taste better than processed soft foods). After all, your jaws need the proper nutrients to stay strong and healthy through a balanced diet and exercise (chewing). Did you know the jawbone is one of the first places osteoporosis is detected? Osteoporosis and bone loss can be reversed with dental implants. Replacing your teeth with dental implants also fill holes in your smile that can lead to general health problems like inflammatory diseases from dental bacteria traveling through your blood stream. A healthy body starts with a healthy smile! Our Next Dental Implant Candidate May be You! If you’re considering getting dental implants, meet with your OKC dentist. Dental implants aren’t right for every patient, so it’s important to schedule a consultation. If we need to, we can recommend a better-fitting replacement solution for you. Call us today!